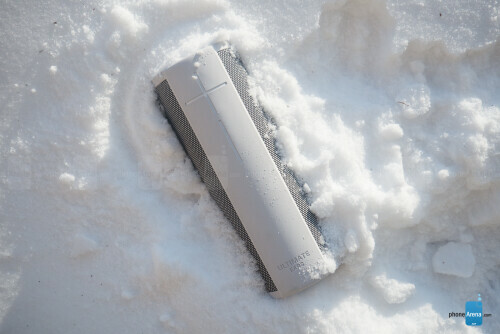 The portable Bluetooth speaker market is absolutely overflowing with options, but actual competition often comes down to a handful of brands. Ultimate Ears started out creating tailor-made earphones for popular touring bands to use while on stage. 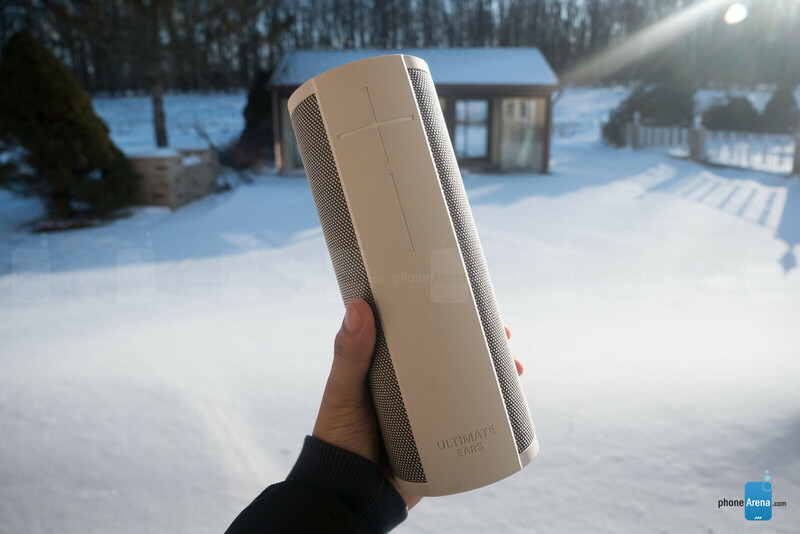 Later acquired by Logitech, UE transitioned into the Bluetooth speaker market and quickly made a name for itself among the top competitors. 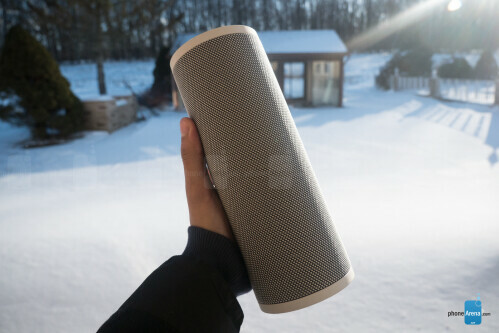 Speakers like the original Megaboom, which touted “intensely rich sound” and deep bass to match, as well as the ability to daisy-chain over 100 devices, served to make their speakers a fan favorite. But does the Alexa-toting, Wi-Fi-enabled Megablast deliver on the “thundering bass” and “stunning clarity” the company promises? Or, at $300, does it yield to more established competitors? The Megablast uses the same cylindrical design that UE has employed for years. 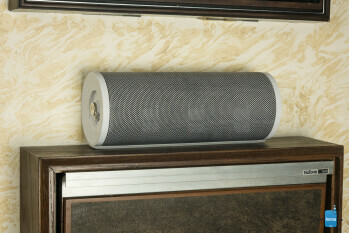 This shape complements the speaker's acoustic characteristics, namely to provide 360-degree sound. Woven speaker cloth wraps around the device, meeting a strip of rubber which runs the length of the speaker and flows into the Megablast's top and bottom made of the same material. It’s a pretty non-descript appearance unassuming in nature. The UE Megablast does come in a variety of nice-looking colors: merlot (red), blizzard (white), blue steel (not actual steel), and graphite, so you can pick something more to your liking. IP67 waterproofing means this speaker won’t mind a dip in the pool either, as long as it’s for less than 30 minutes in no more than a meter of water. At the bottom is a screw-in metal link to which a strap can be attached. This link can also be replaced with an inductive charging piece which works only with UE's proprietary dock, sold separately for $40. The UE companion app is used for initial speaker setup, which includes Wi-Fi, Bluetooth, and Alexa connection. But it can't do much more, and while we appreciate the simplicity, there’s a couple things we might add. 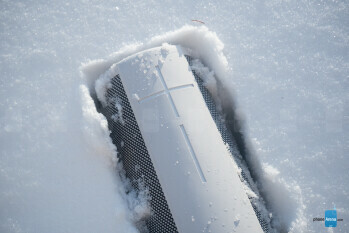 First would be volume control for the speaker when streaming music from one of its in-built services. This seems quite an obvious missed opportunity, given the fact that while streaming from the speaker, the only way to adjust the volume is through the buttons on the speaker or by asking Alexa – an exercise in futility above a certain volume or distance from the music-playing speaker. 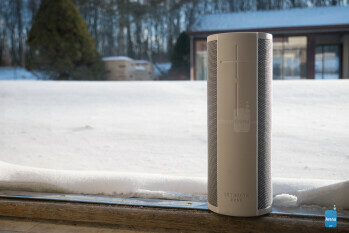 We’d also add the ability to summon Alexa from the app for the same reason, as it was often quite difficult for the speaker to recognize the Alexa hot phrase while playing music at almost any volume. While not playing music, though, the Megablast was just as useful and effective as a regular Echo device when it came to picking up commands. UE likes to keep things pretty simple when it comes to controls. Two large buttons on the side control the volume on the speaker, while a Bluetooth button and power button grace the top. 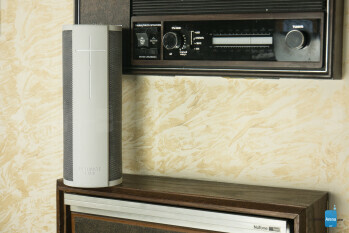 Wi-Fi connectivity adds the ability to stream music without a phone, directly from the Megablast. Streaming compatibility on the Megablast is limited to Pandora, Sirius XM, iHeartRadio, TuneIn, and Amazon Music – not our favorite selection. No offense to Amazon’s music service, but it feels unintuitive and underdeveloped, leading us to long for alternatives. The other services only offer radio-esque functionality – a much more limited experience than, say, Spotify or Apple Music. 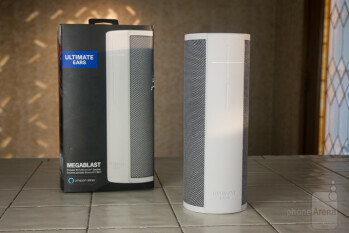 The UE Megablast unfortunately forfeits the ability to daisy-chain multiple speakers, unlike its sibling, the Megaboom, which can support connections to over 100 other Megabooms, simultaneously. The Megablast has a Bluetooth range rated at about 150 feet, which we found to be quite feasible, even through a couple walls. Sound quality is quite good on the Megablast. Mids and highs are loud, crisp, and composed but bass response left us longing. Music sounds mostly full-bodied save for this relative bass deficiency, though certain songs will make you miss the lows more than others. The Megablast gets plenty loud though. Able to fill a large room or backyard with crystalline acoustics, the Megablast sounds rich in treble and, like many speakers, sounds best a few clicks below full volume, where the sometimes-piercing highs are notched down a bit, and overall sound appears to have the best balance. 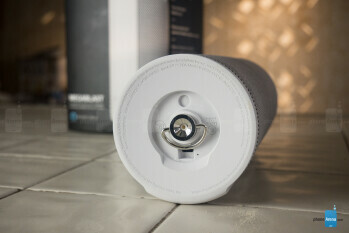 While suitable for the backyard barbecue or living room jam sesh, the Megablast sounds best when placed in the corner of a room, as the walls help to reverberate the sound and create a fuller sonic experience, somewhat mitigating the speaker’s mediocre lows. Meeting the standard of most if its competitors, the UE Megablast is rated for 16 hours of playback time – a threshold we find quite believable based on our prolonged use. Of course, volume level and other factors like Wi-Fi strength can chip away at this. As mentioned earlier, UE manufacturers an inductive charging dock for the Megablast, which is sold separately, but can sometimes be found bundled with the Megablast for an additional cost – about $40. It’s a nice convenience to have though, especially since the Megablast is Alexa-enabled. Also, due to the regular micro-USB charging port’s position at the bottom of the device, the Megablast can’t be placed upright while charging, unless turned upside down. The UE Megablast delivers a lot of value, even at this price point. IP67 waterproofing, colorful appearance, and loud, enviable sound quality top off quite a solid package. Alexa’s integration could be deepened, as could the acoustics, but even so, it’ll be pretty hard to regret purchasing one of these. 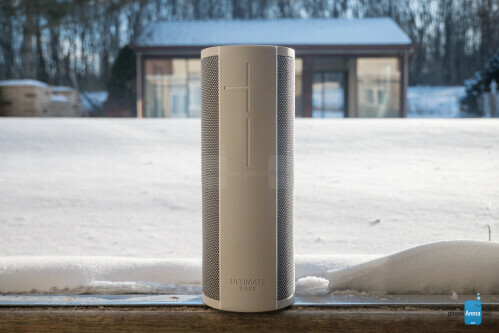 When it comes to alternatives, consider checking out the Bose Soundlink Revolve+ (also $300). While it lacks the Megablast's Wi-Fi connectivity and high water-resistance rating, it could win you with its sound properties and metal construction.